Efforts to implement a smoke-free environment in Chinese universities and colleges are improving, but challenges still remain, according to an investigation by the Chinese Association on Tobacco Control. In July 2010, the education and health ministries jointly prohibited smoking in the teaching and office areas, libraries and laboratories of institutes of higher education, as well as in primary and high schools. However, the smoking ban has been poorly implemented due to insufficient supervision and the lack of penalties for offenders. About 17 percent of colleges and universities met the required standards this year, compared with just 2 percent in 2011, Xu Guihua, vice-chairman of the association, said on Tuesday at a news conference in Beijing. "However, not all the universities are seeing improvements, and some still have areas severely affected by tobacco," Xu said. The investigation – conducted in 800 colleges and universities in 31 provinces – was based on photos and video recordings, said Suo Chao, the association’s spokesman. No advance warnings were given for the sake of justice and fairness, the association said. A total of 139 universities and colleges, accounting for 17.38 percent of the total, met the standards this year, the report said. The criteria included the number of cigarette butts and smokers discovered, cigarette advertisements, and anti-smoking signs, among others. "All institutes are equipped with anti-smoking signs, although only 56.5 percent have signs on campus," Suo said. "In addition, there was also a 0.65 percent decrease in universities with tobacco ads." However, the number of institutes equipped with anti-smoking signs also saw a decrease of 4.05 percent compared with last year, he said. Among the 800 universities and colleges analyzed, those specializing in languages, medicine and arts ranked the highest, while those specializing in agriculture, physical education, politics and law were at the bottom of the table. In geographical terms, schools in Beijing, Guangdong province and Chongqing had the best smoke-free environments, while Hainan and Jiangxi provinces and the Inner Mongolia autonomous region were the worst, the report said. "Smoking in college, especially among juniors and seniors, is not rare," said Wang Xiaotian, a junior student at Beijing Sport University. "It’s common to see someone lighting a cigarette in a boy’s dorm, and it would be considered weird if someone said something about it." The association says more needs to be done. "The current smoking ban lacks impact, not only due to poor enforcement, but also due to the lack of penalties," Suo said. "The situation is especially severe among young people." The earlier people start smoking, the more difficult it will be for them to quit, Suo said. As the world’s biggest producer and consumer of cigarettes, China has more than 300 million smokers and 740 million people are exposed to second-hand smoke on a regular basis. 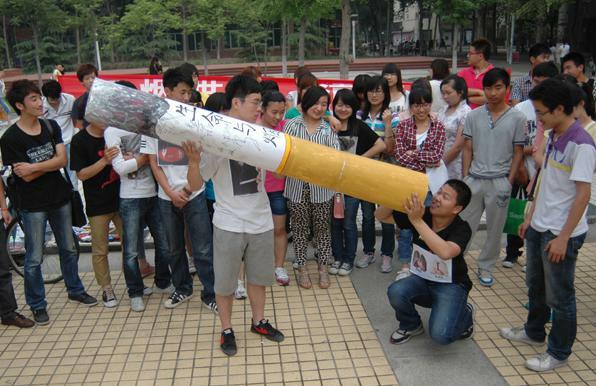 About 1.2 million Chinese people die from smoking-related illnesses every year, according to the association. "With more than 7,000 chemicals, cigarettes usually lead to respiratory and cardiovascular diseases such as heart attacks and asthma," said Li Qiang, a professor with the Tobacco Control Office of the Chinese Center for Disease Control and Prevention. "It’s urgent that colleges and universities take some measures to free young people from tobacco," Li said.